At times, josei manga seems to be divided between two extremes. At one end are the socially-conscious dramas that helped to define the genre, such as the works of Kyoko Okazaki and Moyoco Anno. At the other end are the smutty Harlequin-esque ladicomi that seem to make up the bulk of the genre (not to mention search results on many a digital manga site). 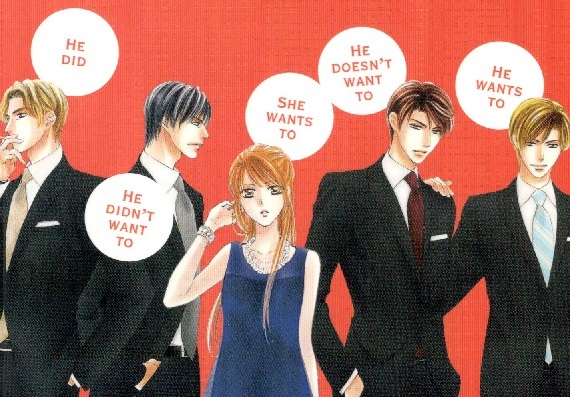 Then there are josei manga like Izumi Miyazono’s Everyone’s Getting Married. On the surface, it sounds like something that would fit into the latter category. It’s about Asuka, a successful banker who wants nothing more than to get married and become a homemaker, and how she falls for Ryu, a successful, supportive newscaster who wants nothing to do with commitment. Once you look beyond that premise, though, Everyone’s Getting Married reveals itself to be something of a bridge between those two extremes. In a way, it tries to “have it all” by combining the drama of a romance novel with some surprisingly modern and feminist takes on its heroine’s life choices and the modern Japanese workplace to create something entirely new. From the very first page, Asuka states her case to the audience: “I want to be a full-time homemaker. It’s not that I don’t like my job. I just think that being a wife and a mother is my calling.” It’s so rare and refreshing to find a manga that portrays a major lifestyle choice like this as just that: a choice. Asuka isn’t afraid that she’ll be single forever or that her biological clock will expire if she doesn’t leave the workforce and get married right now. She doesn’t want to leave her job because she’s incompetent at it. She’s not being forced out of her position by a coworker or supervisor’s harassment. She is simply making her own choices about the direction of her own life and career and is glad to have the opportunity to make such a choice. The series respects the hard work and importance of a homemaker. Over the course of the series, Asuka shares stories with Ryu about her childhood and how her own mother made their home a warm and welcoming place. She would comfort Asuka when she was being bullied with kind words and hugs. When Asuka’s father had to bring his work home, she helped Asuka to understand and appreciate his own hard work. Asuka’s mother maintained not only a home, but an atmosphere that truly brought every member of their family together in harmony. It’s these happy memories that drive Asuka to follow in her mother’s footsteps. For her, becoming a homemaker isn’t a step down from her current career, but instead a way to emulate her biggest role model and forge a safe haven for herself and her own future family. Thus, Asuka doesn’t see any conflict with putting just as much effort into honing her homemaking skills and relationships as she does towards home financing and the stock market. Meanwhile, Ryu is the only person in the story who respects the notion of being a homemaker and Asuka’s choice to do so. He’s the one who calls homemaking a “respectable career,” acknowledges that it requires a lot of hard work and sacrifice, and encourages Asuka to stick with her decision even as his own issues with commitment cause her to doubt her choice. A fictional character like Asuka having such a choice in the first place and the value of a homemaker being given such narrative importance speaks volumes to the real-world progress that has been made for women in the workplace. Ever since the days of Betty Friedan’s The Feminine Mystique, feminism has fought for the right for a woman to pursue whatever career she wished. She and the many feminists that came afterwards wanted to create a world where a woman’s work could extend beyond the home and a select handful of stereotypically feminine positions and have that work be valued as equally as a man’s. This particular movement was easily one of the biggest success stories of second-wave feminism, as more and more women have chosen to work outside of the home since the 1970s. Nowadays, more women work outside of the home than within and there are increasingly fewer fields where women are still barred from entry. One of the few downsides to that success is that those women who did voluntarily choose to become homemakers have had a much harder time convincing the world at large that the work they do is valid and valuable. It’s a debate that has only grown more relevant over the decades as second-wave feminism gave way to the third, and those who chose to be homemakers found themselves struggling to reconcile their perception of feminism with their everyday lives. They also struggled to convince the larger public that homemaking has larger cultural and economic value than just an unpaid “second shift” to be added onto a “proper” job, and that those who choose to make their homes their careers are contributing just as much valuable time and effort as those who work outside of the home. It’s a debate that rages even today, and it’s this same debate that informs much of what goes on in Everyone’s Getting Married. Asuka is dealing firsthand with this same struggle. She understands the emotional value of homemaking and is mostly confident in her choice, but the conflict that drives the story is convincing her peers and finding a romantic partner that values her efforts and respects her choices. The best part is that Miyazono doesn’t lecture the reader on this, but instead weaves this modern, relevant debate into the narrative’s very fabric while still delivering a well-written and entertaining romance. Miyazono’s choice to make feminism so integral to her heroine and her plot becomes doubly important when you consider the story’s setting: modern-day Japan. Despite what popular stereotypes would suggest, feminism does in fact exist in Japan. It was influenced by many of the same seminal works as Western feminism and it too has evolved over the decades. That being said, it is equally true that what forward strides have been made were more hard-fought and slowly implemented than their Western counterparts. There are still many Japanese businesses where women can only aspire to become “office ladies,” a legion of uniformed workers performing low-level administrative and secretarial work for meager pay with little hope of promotion. Even those women who manage to work their way to higher positions or into other fields are still expected to give up their jobs once they’re engaged and/or pregnant and become full-time homemakers for years, if not the rest of their lives. This tradition continues to be reinforced time and again through Japanese pop culture, and josei manga is no exception to this. Many series simply accept and reaffirm this tradition for the sake of cheap, bodice-ripping romance between powerful businessmen and lowly secretarial staff. Even relatively recent and progressive josei works aren’t completely exempt from this line of thinking. For example, the heroines of Moyoco Anno’s Happy Mania and Yayoi Ogawa’s Tramps Like Us may be dealing with radically different circumstances, but both of them still operate under the expectation that they’ll have to give up their jobs upon getting married. The only difference is that the former eagerly anticipates this as a way to escape the endless grind of entry-level jobs and casual dating; the latter views it with trepidation due to her own insecurities about her public and private image. Within the last decade, though, these notions have started to change within Japan at large, and those changes have started to bleed back into the josei manga they read. In the last few years there have been an endless supply of thinkpieces on Japan’s declining birth rates and marriage rates. Once you start reading between the lines of those articles, though, you see a far more encouraging trend: a growing number of young women in Japan who are rejecting older traditions and taking control of their own lives and careers. They are more actively pursuing full-time work and taking on more prominent positions within corporations and even the government. They are focusing more on their careers and casual dating than on marriage and motherhood. They are not simply following cultural norms for the sake of tradition, but instead making active, even empowered choices about their own lives. It’s this generation of women that is the target audience for josei manga like Everyone’s Getting Married. Is it any wonder then that Miyazono would make an effort to make Asuka’s world better reflect the changing realities and attitudes of her audience? As a result, Asuka can hold a powerful banking position and find herself surrounded by an equal number of male and female coworkers, and can also have a hard time finding romantic partners who want commitment and a wife that doesn’t wish to work outside the home. The same goes for her boyfriend Ryu’s workplace, where there are just as many women behind the scenes at his studio as there are in front of the cameras at every level. Their world is not all that far removed from that of the reader, even if it might be a bit more idealized. Still, knowing this makes Asuka’s choices and conflicts not just more relatable, but also inspirational for its readership. These are narrative choices that even a decade ago would not have been common, much less available in English. Everyone’s Getting Married is still being serialized and the English language release from Viz is only five volumes into its run, so I wouldn’t dare to make any predictions about how Asuka’s story will ultimately turn out. What I can say with confidence is that it’s already distinguished itself as not just one of the best josei manga currently being released, but also one of the most explicitly and surprisingly feminist manga titles I’ve read in years. It’s an adult romance that not only embraces modern feminist values, but utilizes them to create an story that better reflects the realities of its audience both at home and abroad. I can only hope that it finds the level of success it rightfully deserves and that we see more josei manga like it in the years to come. Special thanks to Sarah Hayes for her assistance with research for this article. Megan R. has spent over half a decade talking about the joys of manga to anyone willing to listen. She can be found on Twitter, on Patreon, and at her own review blog, The Manga Test Drive.